I love this photograph. That's my mother on the right, and her younger sister Carmel (my favourite auntie) taken in Trafalgar Square c.1954. Mum would have been 20, Carmel barely 18. It's quite obvious, looking at them over 60 years ago, they hadn't got a care in the world - their whole lives ahead of them. Although mum's not around anymore, I decided to bring this photo to life, blow it up, frame it, and give one copy to Carmel and one to my dad - both very much alive and kicking. I've been following Andy the Photo Doctor (@andythephotoDR) on Twitter for a while now - he restores historic black & white football photos and, with the knowledge of old football strips, can kickstart a once tired tired image and make it look like it was taken only yesterday. I asked Andy if he would do a commission for me, we agreed a price and then it was down to business. 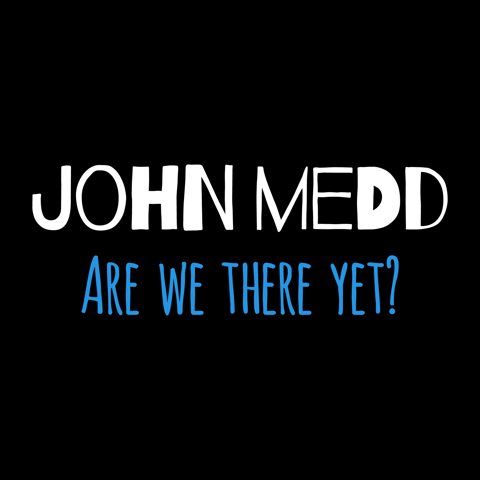 No, but then, when did I ever? But fair play to Andy, it was only a couple of days later when I got this sneak preview - the crop on the right (Duffle Coat Man had to go) was my edit. I liked this version so much I took it to my picture framer straight away. And then, only a couple of hours ago I got the finished article. Again I'll probably crop matey on the right - you never know who's behind you when you're having your photo taken, do you? In an ideal world I'd also want to air brush the guy standing directly behind mum; but no worries, I'm absolutely made up with the final image. I can't stop looking at them. 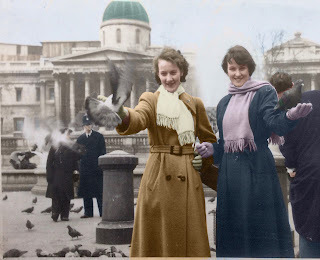 The colour really brings the photo to life yet manages perfectly to keep it looking appropriately dated at the same time. I don't think the background characters are a problem personally as they bring even more movement and reality to the scene and didn't distract me from the focus on your mum and Carmel at all. Carmel and your father are going to be so thrilled! Please report back! C - When I first opened Doctor Andy's email I don't mind telling you it stopped me in my tracks. I'm glad you like it too. CC - He's a genius, isn't he? And I don't use that word lightly. 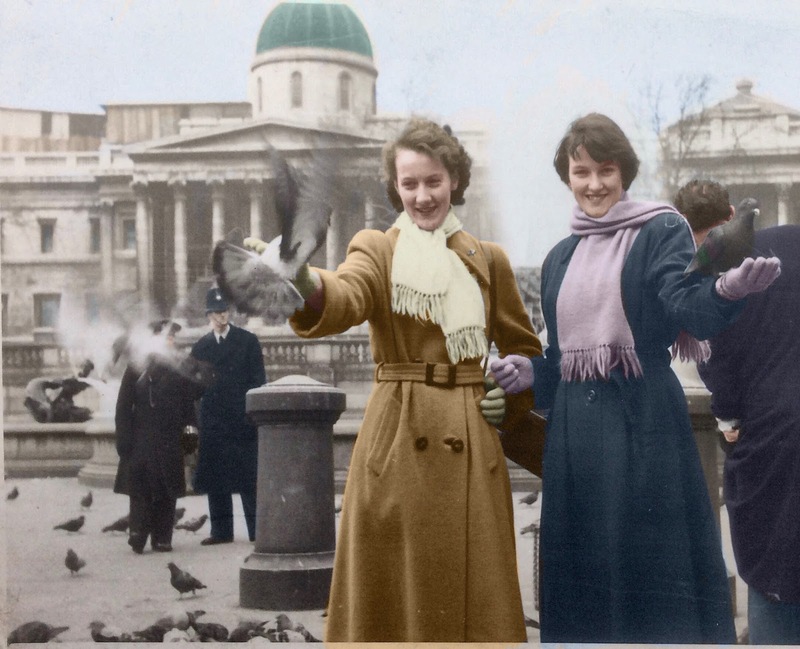 This is a truly lovely picture which will really be appreciated - I have a black and white pic of my mum & dad in pretty much the same spot, taken (probably) the same year, which would be a prime candidate for the same treatment as it was summer my mum is in a patterned dirndl skirt. Like C, I think the picture looks fine with the other characters, as a busy scene, and they are at the centre of it all. Clicked on the link to the post with your mum's obit - Long before my time here but was lovely to read it to get the context of the picture - She was a lovely looking lady (as was Carmel) and they always looked just so smart back then. Noticed that she was born just before my mum, she married your dad just after my mum married my dad and I was born the same year as you so lots of parallels in the timeline. 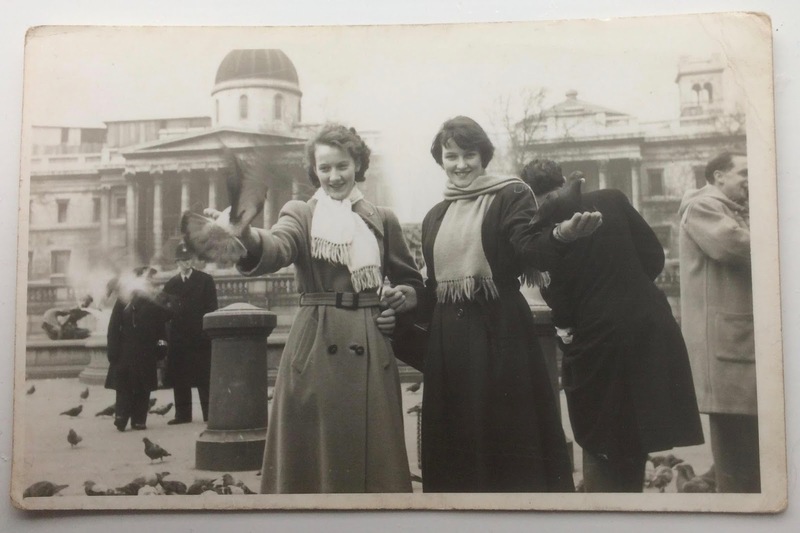 When I posted it on Twitter, a couple of people responded (including the Swede) and posted B&W photos of their parents - again from the 50s, in Trafalgar Square, feeding the blessed pigeons - it must have been a rite of passage. So, if you have a similar photograph of your parents, you really must share it! Agreed? 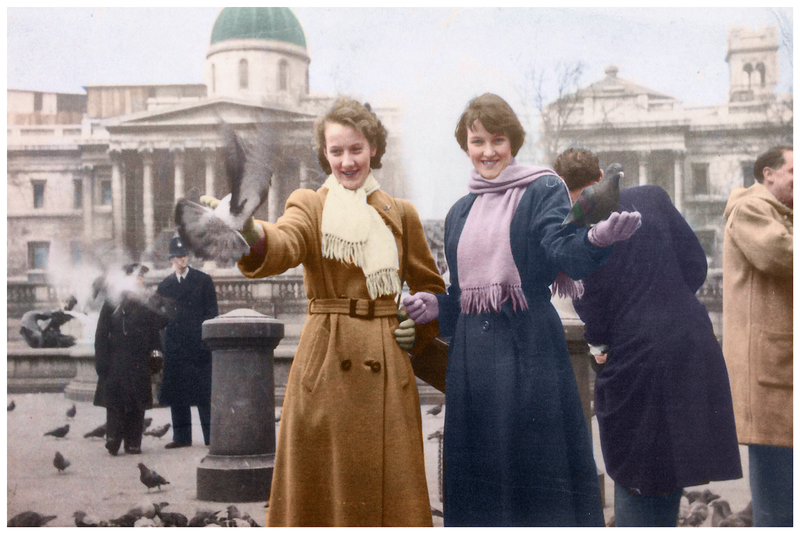 Those pigeons must have been well fed back then - Yes if I stumble upon a song that suits the picture well, I'll have to include it. Ha ha - very good. Mum is coming round for lunch in an hour so I'll show it to her then and let you know her comments . Lola looks so much like Mum in this photo. Didn't they come over from Ireland together to do their nursing training? Can you pull a few strings?